Putin’s loudest critic already faces a suspended, five-year sentence for a previous conviction of stealing from a Kirov timber company. He could face another 10 years if convicted on new charges linked to the Yves Rocher case. A Moscow court has seized the property of opposition figure Alexei Navalny and his brother Oleg as part of an investigation into charges that the brothers embezzled money from the Russian branch of cosmetics giant Yves Rocher. The Navalny brothers were charged last month with theft and money laundering in the case of the French cosmetics company. The investigation claims the Navalny brothers stole more that 26 million rubles ($811,000) from Yves Rocher Vostok, the Russian branch of the company, and 4 million rubles ($130,000) from the Multiprofile Processing Company. Under the first of these charges the brothers could face up to 10 years imprisonment and a further 5 under the second charge. Alexei Navalny already has a suspended sentence of five years after being convivted in September for stealing 16 million rubles from a Kirov timber company. Under a petition filed by the investigators the Basmanny Court in Moscow, the state has the right to seized the property of Oleg and Alexei Navalny, the court’s press secretary Natalya Romanova reported to Interfax on November 12. “The property of Alexei and Oleg Navalny has been seized as an interim measure,” she stated, clarifying that from Oleg Navalny the court seized shares, accounts and a stake in the Kobyakovskaya Basket Weaving Factory. 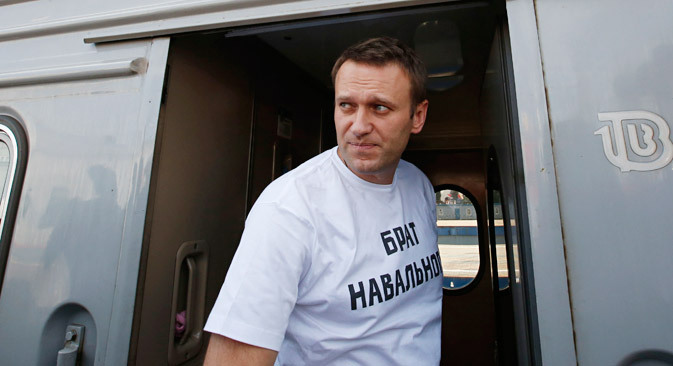 The press secretary refused to be drawn on which property had been seized from Alexei Navalny. A source at the law enforcement agencies related to Rosbalt said that the petition on the arrest of the Navalnys’ assets, including money, was submitted by Roman Nesterov, the investigator of the Russian Investigative Committee for Very Important Cases. The investigator was also part of the investigative group on the Kirovles Case, under which Navalny was initially sentenced to a genuine term of five years in a penal colony, although the punishment was made provision in the middle of October. Navalny used his blog to comment that all of his assets could be viewed in his pre-election declaration, compiled during the time he was standing for Mayor of Moscow. “I don’t know what the property is that they have seized; I was not invited to the court where this matter was decided. We’ll see when we see the ruling,” he said. According to the investigators, Alexei Navalny’s younger brother Oleg, in his position of deputy director of Russian Post, convinced Yves Rocher Vostok to enter into a contract for postal services with Main Subscription Agency [Glavnoe Podpisnoe Agentsvo], a company created by Alexei Navalny, the BBC Russian Service reported. The investigators believe this company rendered no transportation services and is unable to do so, rather it farmed the work out to another company managed by an acquaintance of Oleg Navalny and whose services were cheaper. The investigators assert that they had discovered a similar scheme in place surrounding the Inter-regional Processing Company. According to the Russian Investigative Committee, in 2008 Oleg Navalny convinced the Inter-regional Processing Company to enter into contracts with his company for shipping receipts, letterheads and other printed matter. The investigators believe that these services were rendered at overstated prices, resulting in the Navalny brothers inflicting damage on Inter-regional Processing Company to the tune of 3.8 million rubles. At the same time, the investigation initially states that in the case involving Yves Rocher, the Navalny brothers had stolen 55 million rubles, laundering part of this amount through the Kobyakovskaya Basket Weaving Factory, owned by the retired parents of Alexei and Oleg. It was specifically the stake of Oleg Navalny in this company’s share capital that the Basmanny Court ordered to be seized on November 12. The factory produces woven baskets and garden ornaments in the shape of animals. Based on materials from the BBC and Newsru.com.